"Sampath Speaking" - the thoughts of an Insurer from Thiruvallikkeni: Russian warship Dimitrii Donskoi, claimed to have been spotted for salvage ! Russian warship Dimitrii Donskoi, claimed to have been spotted for salvage ! A South Korean salvage team has discovered the wreck of Russian warship Dimitrii Donskoi, 113 years after it sank. In law, abandonment is the relinquishment, giving up or renunciation of an interest, claim, civil proceedings, appeal, privilege, possession, or right, especially with the intent of never again resuming or reasserting it. In general, to abandon is to give up or renounce. However, the word abandonment is used in different senses in marine insurance. It may simply refer to the act of physically quitting a vessel, usually when a casualty is in danger, imperilling the safety of those on board. With particular reference to Marine Insurance (MI Act) - the general concept of abandonment is contemplated when there is a Constructive Total loss (CTL). According to MI Act, where there is a CTL, the assured may either treat the loss as a partial loss or abandon the subject matter insured to the Insurer and treat the loss as if it were an actual total loss. Further proviso in the Act states – ‘where the assured elects to abandon the subject matter to the Insurer, he must give notice of abandonment’- if he fails to do so, the loss can only be treated as a partial loss. Dmitrii Donskoi, was an armoured cruiser built for the Imperial Russian Navy in the early 1880s. She was designed as a commerce raider and equipped with a full suite of sails to economize on coal consumption. The ship spent the bulk of her career abroad, either in the Far East or in the Mediterranean. Dmitrii Donskoi was assigned to the Second Pacific Squadron after the Japanese destroyed the Russian ships deployed in the Far East during the early stages of the Russo-Japanese War of 1904–05. The squadron was intercepted by the Japanese fleet in May 1905 in the Battle of Tsushima after a lengthy voyage from the Baltic. Dmitrii Donskoi took part in the Battle of Tsushima, which was disastrous for Russia. It fled crippled and chased by Japanese warships and was eventually scuttled by its crew to avoid surrender off the coast of what is now South Korea’s Ulleung Island, or Ulleungdo. The cruiser is a coveted target for treasure hunters. According to some historical accounts, the Dmitrii Donskoi carried the treasury of the entire flotilla, meant to cover port expenses and pay the salaries of sailors and officers. 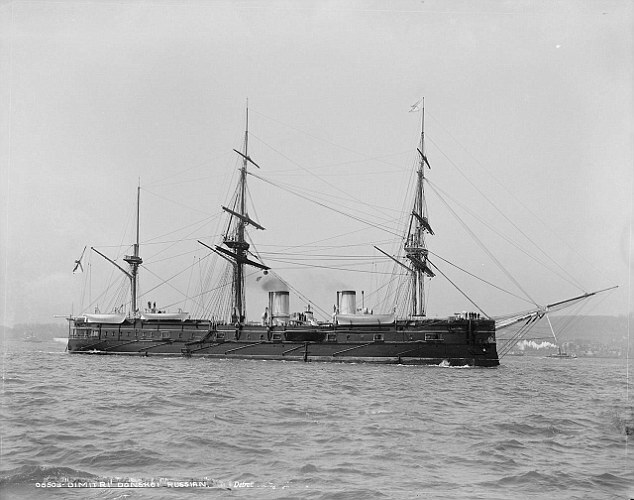 Individual gold reserves of several other ships damaged in the battle may have been transported to the warship as well. There has been belief that whoever manages to find the wreck site may become a very wealthy person. Shinil Group, a South Korean company, says it knows where the ship lies. On Tuesday it said its exhibition used a couple of submersibles to dive 434 meters deep in seas 1.3 kilometers off the island and found the rusty hull of the armored Russian warship. Footage and photos released by the treasure hunters clearly shows the word ‘Donskoi’ written in Cyrill. .. .. and according to its finders, Donskoi is believed to have been carrying the gold supplies of the entire Second Pacific Squadron when it sank, which would be worth $133billion at today's prices. Divers from salvage firm Shinil Group have been searching for the wreck for years and finally located it on Saturday at a depth of 1,400ft (434m) around a mile off the coast of Ulleungdo. Teams concluded that the wreckage was likely the Donskoi because its sail plan appeared identical to the long-lost ship, which had three sails and two chimney stacks, relying on both wind and coal power to drive it. A second exploration of the wreck the following day confirmed it to be the Donskoi after the ship's name was spotted written in Cyrillic across its stern. Divers said the stern of the ship is in a poor condition along with the hull which has partially split, but that the upper wooden deck remains largely intact. The armour on the side of the hull is well-preserved while the cannons, machine guns, anchor and steering wheel are all still in place. The ship was escorting transport vessels at the rear of the Second Pacific Squadron when the flotilla was attacked by a much larger Japanese force at the Battle of Tsushima. A large number of iron boxes were also discovered in the ship's hold, which may contain the gold, though divers have not yet been able to open them. Operations are now underway to raise the wreck from the sea bed along with companies from China, Canada and the UK. Shinil Group believes there could be as much as 200 tons of gold on board the ship, which would be worth around $133.4billion. Should their hopes prove correct, they have pledged to donate 10 per cent of their find to help develop Ulleungdo, which is a largely uninhabited island but an important tourist destination for South Korea. Development plans would include a museum dedicated to the ship, according to The Telegraph. Another 10 per cent will be gifted to Russia as the owner of the wreck, and would be used on projects such as a railway to connect Russia and South Korea running through North Korea. At least 60 of the crew were killed and 120 more wounded, including Captain Ivan Lebedev, who ordered the ship to anchor off Ulleungdo and took his men ashore. Given a history of false claims about discovering the Donskoi in the past, Shinil Group has promised to bring some of Lebedev's personal effects to the surface as further proof of their discovery. The salvage operation is scheduled to begin October and November and further finds will be presented to the public in December, RT reported. ~ largely reproduced from Daily Mail UK. Saint Dmitry Ivanovich Donskoy (1350 – 1389) son of Ivan II the Fair of Moscow, reigned as the Prince of Moscow from 1359 and Grand Prince of Vladimir from 1363 to his death. He was the first prince of Moscow to openly challenge Mongol authority in Russia. His nickname, Donskoy (i.e., "of the Don"), alludes to his great victory against the Tatars in the Battle of Kulikovo (1380), which took place on the Don River.